An introduction to Yixing tea pot master Zhu Xinnan. My tea partner HQ has dealt with Yixing tea pot for years and has done well by it. He travels to Yixing frequently to see the potters and knows the market like the back of his hand. However, you need not be an insider to find a good tea pot. Once you understand how it works, the whole thing is quite transparent, especially if you are dealing with the top end of the market (which we do). Why? While there are ten of thousands of potters in Yixing, only a few hundreds can be regarded as masters. These masters sit examinations regularly and are assessed by expert panel before they can be promoted to the next level. The key is to understand who these potters are and the quality of their work. It is a small pond to fish. Having some appreciation of of aesthetic and understanding of clay materials and craftmanship obviously won't hurt. 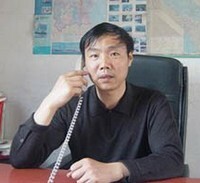 Mr Zhu Xinnan (朱新南), born in 1957 in Yixing from a long line of potters, is one of these elites. He is renown for being a highly skilled potter and wealthy man with a large inventory of rare, seasoned Yixing clay. When we first ordered 100 tea pots from him in 2009, he had two titles: National Level Assistant Craft Master (国家级助理工艺美术师) and Craft and Art Master (工艺美术师). In 2015, he was promoted from Assistant Craft Master to Craft Master (国家级工艺美术师), which has led to the doubling up of the value of his tea pot since 2009. This is already the third most senior title in the Yixing world. At the writing this article, I heard he was promoted again to Senior Craft Master (国家级高级工艺美术师) at the end of 2018, which would result in further appreciation of his tea pot. In other words, he is just one step away from the highest title - Institute Craft Master (研究院工艺美术师) - of which there are only a handful. HQ is an avid seller of one such potter - Shen Jianqiang (沈建强）). His pots currently cost upwards of $4,000. Zhu Xinnan graduated from the Jiangsu Industrial School in 1980, before taking up apprentice in Yixing Pottery Factory to learn creative design.